Part 1 of this series discussed the importance of starting and maintaining a tenant file from the inception of the lease to its termination. The next step in preparing for an eviction case will be to develop a program for a year long monitoring of each rental property. The landlord needs to make it a regular practice of monitoring and taking pictures of the exterior of the rental unit. Keep a folder of those photographs for later use in your eviction case. 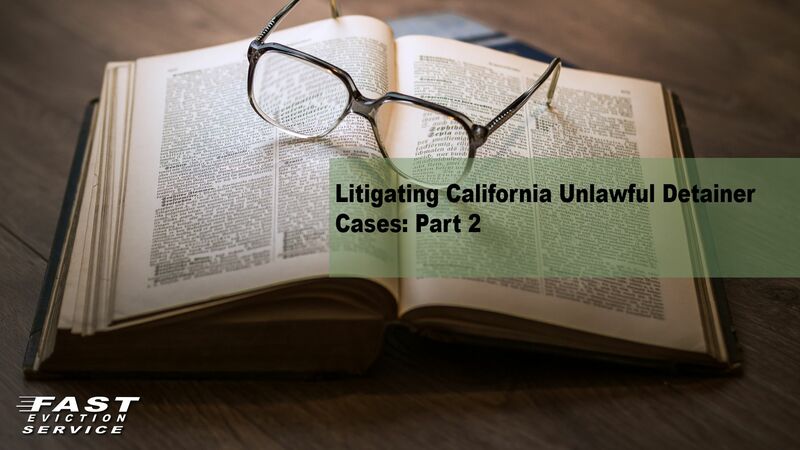 The landlord must also make it a regular practice to inspect the interior of the rental property by serving a 24-hour Notice To Enter Dwelling Unit, which is allowed under California Law. The landlord should make it a regular habit, at least twice a year, to serve the 24-Hour Notice of Right to Inspect on each tenant by posting on the door of each rental unit and by following through by making the inspection at the appointed time. There are several reasons for using a 24-Hour Notice To Enter Dwelling Unit. First, it gives your tenant notice that you are very interested in the rental property and how the tenant is using it. Second, it can provide the landlord with very valuable information about how many occupants are living in the rental unit and whether the tenant is keeping the rental unit in a clean and sanitary condition. Remember to make sure you use your cell phone to take pictures or a video each time you inspect the rental property. Most landlords make the mistake of only starting to plan for the Unlawful Detainer eviction case once the tenant fails to pay rent, breaches some other covenant in the lease or becomes a problem tenant. That is a mistake. Part one of this series suggests that the landlord start from the inception of the lease to obtain and maintain information that will assist in planning for the termination of the tenancy. The preparation of a lawful notice of termination of the tenancy is the basis for every eviction, except after the termination of a fixed term lease, which does not require a notice. The Notice of Termination of the Tenancy should be handled by an eviction attorney who has significant experience in Unlawful Detainer litigation. If the Notice is prepared incorrectly or the wrong notice is used it will doom the eviction case. Every notice that is used to commence an eviction case has a very specific purpose. For instance, if your tenant has failed to pay rent the landlord can only use a 3-Day Notice to Pay Rent or Quit that accurately states the amount of rent that has not been paid and must also give a location, the days of the week, hours where the rent can be paid and to whom the rent can be paid. The Notice to Pay Rent or Quit must never include any late fees or any other fees charged to the tenant who occupies a residential unit. If any information that is required to be placed on the 3-Day Notice to Pay Rent or Quit is incorrect or missing it will doom the success of the eviction case. Since there are many legal reasons to evict a tenant and each reason requires a specific type of Notice its usually best if the landlord use an eviction attorney who has experience in handling all types of eviction cases. Remember, you must get the notice absolutely 100% correct or you can lose the case and have to start over. The next reason why the Notice must be the right notice and must be accurate is because the type of notice will dictate the type of eviction case that will be filed. Once the eviction notice expires and the tenant is still occupying the property the landlord must file a Summons and Complaint on the official forms designed for that purpose by the Judicial Council, except for a forcible detainer, an eviction after the foreclosure or involuntary sale of the property. The basis for the eviction is determined by the Notice that is given. The courts can be very picky about how the complaint is prepared and an eviction case can be easily lost if the complaint is not prepared correctly. Unless you are armed with the right notice that was prepared accurately and served properly can the Unlawful Detainer complaint go forward. The complaint will also set the tone for how the case will proceed into to eviction battle arena. Once the complaint is filed it will have to be served in a proper manner. Using a licensed process server will eliminate many problems. There is also a presumption in California Law that when a registered process server serves the summons and complaint that such service is legal. Once the complaint is served the tenant has five days to answer if the service was personally delivered to the defendant. That extends to 15 days if the tenant could not be located at the rental property and the summons and complaint was served on an adult family member or other person over the age of 18 who was found on the rental property at the time of the service of the Summons and Complaint. If the tenant does not file a response to the complaint within the time set by law and join the battle a default/default judgment will be entered, and a writ of possession will be issued to allow Sheriff Department to go out and evict the tenant. Lately, it seems it is taking the court longer and longer to enter the default/default judgment, because they are so understaffed due to budget shortfalls, and issue the writ of possession. This causes tremendous frustration for the landlord and the professional staff at Fast Eviction Service who are dedicated to getting your tenants out as quickly as the law allows. If the tenant files a response to the complaint, which can be a motion to quash, demurrer, motion to strike or other pre-trial motion will dictate how to responds. In Part 3 of this series look at what you need to do to prepare for the eviction trial.